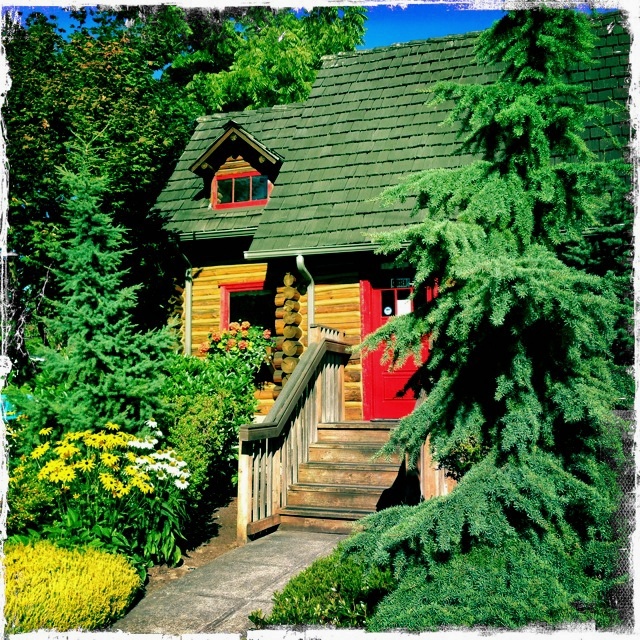 The Ganahl-Hanley log cabin was built in the Seaview neighborhood of Edmonds by Gaston Ganahl. Mr. Ganahl fell in love with the guest cabins at Yellowstone Park and in 1930, hired the builder who oversaw their construction to come to Edmonds and build his dream home. All materials for the cabin came from the land surrounding the construction site and a second guest home on the property. Mr. Ganahl traveled the world as a manager for a logging and shipping company and had a wide group of international friends who frequently came to visit the cabin including the actress Gertrude Lawrence and Ernest Simpson. Simpson was also in the shipping business, and the second husband of Wallis Simpson, who later married the former King Edward, Duke of Windsor. In 1975 the City of Edmonds inherited the cabin and decided to move it to the site of the original City Hall to serve as the new home of the Edmonds Chamber of Commerce. Today it is the headquarters of the Edmonds Historical Society and, staffed by volunteers, is open six days a week. Posted as part of Alisa’s weekly Travel Theme: Architecture. What an interesting log cabin and thank you for the historical background about it. I’m guessing it is not as small as it looks? Beautiful cabin! Thanks for sharing the background information. Thanks for visiting today Amy! Thanks for visiting today Amy, I’m glad you thought the background story was interesting! This looks welcoming, Lisa. Like come and stay a while. Thanks Andra, it is a cute little place. Fascinating history, and a most intriguing looking place. Thanks Sue, I think so too. Lisa I just love all the textures in this picture. Wonderful job! Thanks Nancy, you’re right – there is a lot going on in this picture. 🙂 I’m happy to hear you like it! Quaint quaint quaint….it seems cabins like this are a history of the past. Sad but true, I think they are great and love that it was built with logs from the site. Great that it’s being looked after and used. Too many such buildings get neglected then have to be flattened. I know, it is so sad to see old structures fall apart and disappear… Happily in this case the community raised enough money to repair, move and maintain this little cabin. This is my dream home as well, a cabin surrounded by nature – perfect.